The average age of farmers in the U.S. has been climbing in recent decades and clocked in at 58 as of the 2012 Census of Agriculture (this number refers to the average age of principal operators and doesn’t include all farmworkers). If the group assembled didn’t fit the demographic profile of the average farmer, event organizer Henry Gordon-Smith thinks that’s a good thing. “We must get young people interested in growing food,” he said. Indeed, the farmers and entrepreneurs I spoke with are taking innovative approaches to sustainability, land use and labor as they carve out space for roots and shoots in NYC’s urban landscape. Here are a few of the NYC Agriculture Collective’s movers and shakers. Re-Nuble creates fertilizer for hydroponics from organic food waste. Founder and CEO Tinia Pina became interested in food systems when she volunteered as tutor in Harlem and saw how challenging it was for her students to access the fresh, nutritious food that would help them focus better at school. With Re-Nuble, Pina hopes to solve two problems at once. Most hydroponic farming operations rely on chemical fertilizers as it’s notoriously difficult to achieve the right balance of nutrients with plant-based alternatives. Re-Nuble aims to change that with a cost-effective product that also tackles food waste. The company’s fertilizers are made from organic produce that has been discarded by wholesale distributors. While they are not yet certified organic, Re-Nuble’s products are currently being reviewed for the certification process. Farm.One, which is also a member of the NYC Agriculture Collective, is currently using Re-Nuble fertilizer. Edenworks grows microgreens in a warehouse in Bushwick, Brooklyn. Specifically, they practice vertical aquaponic farming, which sounds science-y and space age (because it is). It also involves poop. Edenworks raises fish and grows greens in a symbiotic feedback system. The nutrient-rich fish manure fertilizes the greens, which in turn filter the water to create a suitable habitat for the fish. Unlike in hydroponic farming, where plants are grown in water with the aid of added fertilizers, the aquaponic method doesn’t create wastewater runoff. To maximize the productivity of the warehouse space at Edenworks, plants are stacked in LED-lit trays. According to CFO and COO Johnny Bowman, Edenworks’ process is so efficient that they have been able to sell their product at a competitive price while upholding their commitment to paying workers a living wage in NYC, no small feat for a fledgling company with a tiny market share. A two-ounce personal salad pack of their spicy microgreens currently retails for $4.49 at the Williamsburg Whole Foods, a price that’s on par with major organic growers. Edenworks hopes to do much, much better though. CEO and Co-Founder Jason Green believes that fresh, ethical, flavorful produce shouldn’t come at a premium. Smallhold builds vertical minifarms that can be installed at restaurants and kept up and running on a subscription basis. Their growth chambers are equipped with sensors and wifi so that they can be monitored remotely by horticulturalists and serviced as necessary. All the restaurants have to do is pick the food. According to CEO and co-founder Andrew Carter, Smallhold’s model not only provides businesses with fresh produce on-site but is also much more efficient than traditional agriculture in terms of land and water use. Smallhold is about to install the first two minifarms of the subscription program at Bun-Ker, a nearby Vietnamese restaurant and bar. The growth chambers will supply Bun-Ker with fresh mushrooms grown in sawdust from a mill in Greenpoint, Brooklyn. 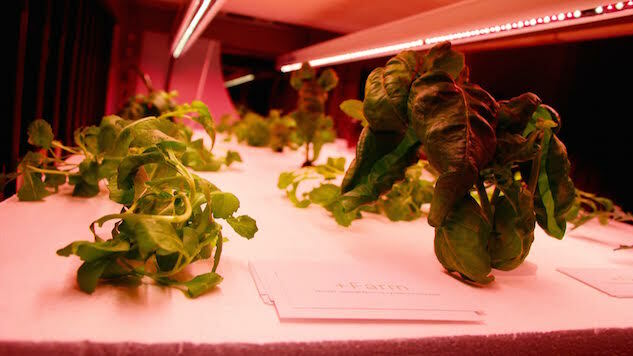 Smallhold’s minifarms can also support herbs and lettuces, and Carter envisions a future where his growing system is a common feature in restaurants, grocery stores, and cafeterias everywhere. Alas, Smallhold’s minifarms don’t come with mini horses. Hellgate Farm makes hot sauce and ketchup with produce grown on rooftops and in backyards in Astoria and Long Island City, Queens. Hellgate partners with building owners and local residents to turn underutilized urban space into gardens. Community participants get fresh tomatoes, peppers, herbs and greens out of the deal, and Hellgate uses the rest of the produce for their sauces. They currently sell three varieties of hot sauce and a ketchup. I was particularly enamoured of the husk cherry hot sauce, which has a tart, ever-so-slightly sweet bite alongside the heat. I’m usually no fan of ketchup, but Hellgate’s is a totally different animal. It’s tangy herby, and tastes like real live tomatoes. “We need to be producing food here as more and more people flock to cities,” says founder Rob McGrath. It’s a timely and tasty proposition.